DECA DURABOLIN Deca durabolint is a favorite to thousands of steroid users. In our recent survey, it was revealed that Deca is the most widely used anabolic steroid. It is easy on the liver and promotes good size and strength gains while reducing body fat Although nandrolone decanoate is still contained in many generic compounds, almost every athlete connects this substance with Deca-Durabolin. Organon introduced Deca-Durabolin during the early 1 960's as an injectable steroid available in various strengths. Most common are 50 mg/ml and 100 mg/ml. 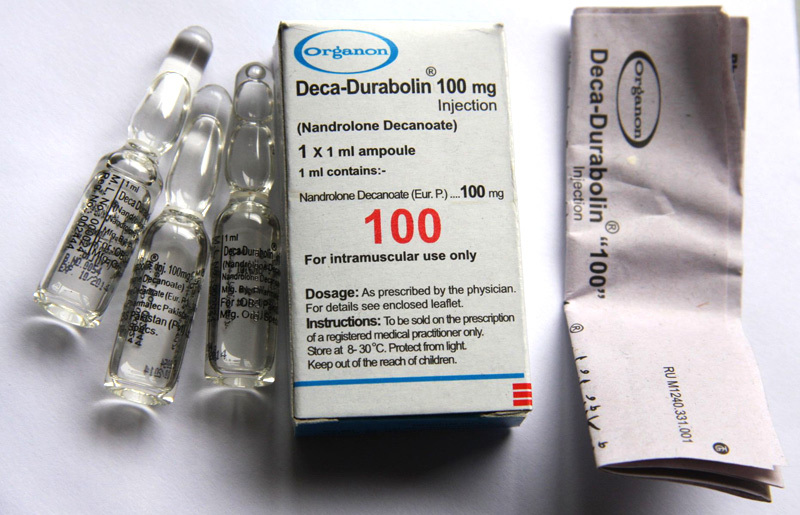 Deca-Durabolin is the most widespread and most commonly used injectable steroid. Deca is large popularity can be attributed to its numerous possible applications and, for its mostly positive results. The distinct anabolic effect of nandrolone decanoate is mirrorred in the positive nitrogen balance." Nitrogen, in bonded form. is part of protein. Deca Durabolin causes the muscle cell to store more nitrogen than it releases so that a positive nitrogen balance is achieved. A positive nitrogen balance is synonymous with muscle growth since the muscle cell, in this phase, assimilates (accumulates) a larger amount of protein than usual. The same manufacturer, however, points out on the package insert that a positive nitrogen balance and the protein building effect that accompany it will occur only if enough calories and proteins are supplied. One should know this since, otherwise, satisfying results with Deca Durabolin cannot be obtained. The highly anabolic effect of Deca durabolin is linked to a moderately androgenic component, so that a good gain in muscle mass and strength is obtained. At the same time, most athletes notice considerable water retention which, no doubt, is not as distinct as that with injectable testosterones but which in high doses can also cause a smooth and watery appearance. Since Deca-Durabolin also stores more water in the connective tissues, it can temporarily ease or even cure existing pain in joints. This is especially good for those athletes who complain about pain in the shoulder, elbow, and knee; they can often enjoy pain-free workouts during treatment while using Deca-Durabolin. Another reason for this is that it blocks the cortisone receptors thus allowing less cortisone to reach the muscle cells and the connective tissue cells. Athletes use Deca, depending on their needs, for muscle buildup and in preparation for a competition. Deca-Durabolin is suitable, even above average, to develop muscle mass since it promotes the protein synthesis and simultaneously leads to water retention. The optimal dose for this purpose lies between 200 and 600 mg/week. Scientific research has shown that best results can be obtained by the intake of 2 mg/pound body weight. Those who take a dose of less than 200 mg/week will usually feel only a very light anabolic effect which, however, increases with a higher dosage. The anabolic and consequent buildup effect of decadurabolin, up to a certain degree, depends on the dosage. In the range of approx. 200 to 600 mg/week, the anabolic effect increases almost proportionately to the dosage increase. If more than 600 mg/week are administered, the relationship of the positive to the negative effects shifts in favor of the latter. In addition, at a dosage level above 600 mg/week, the anabolic effect no longer increases proportionately to the dosage increase, so that 1000 mg/week do not guarantee significantly better results than 600 mg/week. Most male athletes experience good results by taking 400 mg/week. Steroid novices usually need only 200 mg/week. Deca Durabolin works very well for muscle buildup when combined with Dianabol (D-bol) and Testoviron Depot. The famous Dianabol (D-bol)/Deca stack results in a a fast and strong gain in muscle mass. Most athletes usually take 15-40 mg Dianabol (D-bol)/day and 200-400 mg Deca/week. Even faster results can be achieved with 400 mg Deca/week and 500 mg Sustanon/week. Athletes report an enormous gain in strength and muscle mass when taking 400 mg Deca/week, 500 mg Sustanon/week, and 30 mg Dianabol (D-bol)/day. Deca is a good basic steroid which, for muscle buildup, can be combined with many other steroids. Although Deca is not an optimal steroid when preparing for a competition, many athletes also achieve good results during this phase. Since Deca Durabolin is a long-term anabolic, there is risk that with a higher dosage, the competing athlete will retain too much water. A conversion into estrogen, that means an aromatizing process, is possible with deca durabolin but usually occurs only at a dose of 400 mg/week. During competitions with doping tests Deca must not be taken since the metabolites in the body can be proven in a urine analysis up to 18 months later. Those who do not fear testing can use Deca as a high-anabolic basic compound in a dosage of 400 mg/week. The androgens contained in 400 mg/week also help to accelerate the body's regeneration. The risk of potential water retention and aromatizing to estrogen can be successfully prevented by combining the use of Proviron with Nolvadex. A preparatory stack often observed in competing athletes includes 400 mg/week Deca-Durabolin, 50 mg/day Winstrol, 228 mg/week Parabolan, and 25 mg/day Anavar. Although the side effects with Deca-Durabolin are relatively low with dosages of 400 mg/week, androgenic-caused side effects can occur. Most problems manifest themselves in high blood pressure and a prolonged time for blood clotting, which can cause frequent nasal bleeding and prolonged bleeding of cuts, as well as increased production of the sebaceous gland and occasional acne. Some athletes also report headaches and sexual overstimulation. When very high dosages are taken over a prolonged period, spermatogencsis can be inhibited in men, i.e the testes produce less testosterone. The reason is that Deca Durabolin, like almost all steroids, inhibits the release of gonadotropin from the hypophysis. Women with a dosage of up to 100 mg/week usually experience no major problems with Deca Durabolin. At higher dosages androgenic-caused virilization symptoms can occur, including deep voice (irreversible), increased growth of body hair, acne, increased libido, and possibly clitorishypertrophy. Since most female athletes get on well with Deca-Durabolin a dose of Deca 50 mg+/week is usually combined with Anavar 10 mg+/day. Both compounds, when taken in a low dosage, are only slightly androgenic so that masculinizing side effects only rarely occur. Deca, through its increased protein synthesis, also leads to a net muscle gain and Anavar, based on the increased phosphocreatine synthesis, leads to a measurable strength gain with very low water retention. Other variations of administration used by female athletes are Deca-Durabolin and Winstrol tablets, as well as Deca-Durabolin and Primobolan's tablets. Since Deca-Durabolin has no negative effects on the liver it can even be used by persons with liver diseases. Exams have shown that a combined application of Dianabol / Deca-Durabolin increases the liver values which, however, return to normal upon discontinuance of the 17-alpha alkylated Dianabol and continued administration of Deca-Durabolin. Even a treatment period with Deca-Durabolin over several years could not reveal a damage to the liver. For this reason Deca-Durabolin combines well with Andriol (240-280 mg/day) since Andriol is not broken down through the liver and thus the liver function is not influenced either. Older and more cautious steroid users, in particular, like this combination. Click the button below to add the Deca Durabolin 100mg/ml Organon x 50 amps (including shipping) to your wish list.